Uses and properties include stimulating the immune system and restoring energy. Indium is a very rare trace mineral, element number 49 on the Periodic Table. While Indium does not appear to be present in the food chain, traces are, however, found in the human body but only up to the age of 30. Between 1980 and 1999, a number of patents were taken out for nutritional applications of indium sulphate, a water-soluble and bio-available form of indium, because of the many health benefits supplementation seems to offer. Moreover, this form of indium was granted GRAS status - Generally Recognised As Safe - in 1999 by the American administration. Indium appears to have a stimulating and rejuvenating effect on the pituitary gland and hypothalamus which play a major role in hormonal production. This unique feature affects a series of around 30 hormones! 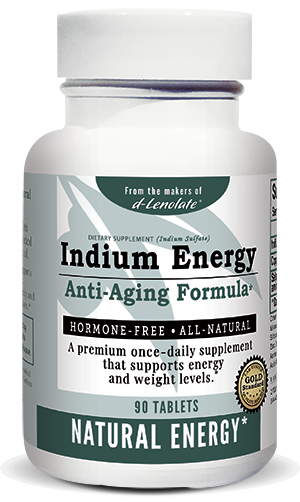 Indium improves the way the body uses other trace elements. According to Dr Henry Schroeder, this bio-availability increases by over 140%. A study conducted in 2000 in Budapest (Hungary), involving 100 volunteers (male and female, young and old, sick and healthy) recorded over 40 benefits associated with supplementation. The most significant was the substantial increase in energy and well-being subjectively reported by the participants. Preliminary findings from animal and human studies suggest a clear reduction (42%) in malignant tumours (in rats) and a very significant decrease (of 75% in three months) in men with PSA levels over 30. Among top Hungarian sportspeople, indium accelerated the elimination of lactic acid, making endurance exercise and recovery easier. While these results obviously need further validation, they have aroused great interest among alternative therapists, with a huge number (over 1000) of anecdotal reports appearing to confirm them. If Indium had only a tenth of the properties attributed to it by these anecdotal accounts, it would still be, without doubt, an exceptional nutritional supplement! It is not our practice to cite such anecdotal reports, however numerous and well-founded. Interested readers may, therefore, wish to consult two references, Indium, the missing trace mineral', by Robert Lyons, ND and Indium, the age-reversing trace element', by medical journalist Morton Walker. One thing is certain: indium sulphate can be used without risk, existing results appear to offer proof and there is potential for significant findings. This product therefore deserves to be tested ! Each box of Indium Energy is sufficient for 90 days' supplementation, the amount of time necessary for you to make up your own mind. Other ingredients: dicalcic phosphate, microcrystalline cellulose, stearic acid, silicon dioxide, magnesium stearate.